Saskatchewan’s provincial parks and recreation sites hit a new attendance record of nearly four million visits in 2016. This is an increase of 108,000 visits over the 2015 record. Visitation to provincial parks has grown 32 per cent since 2007. 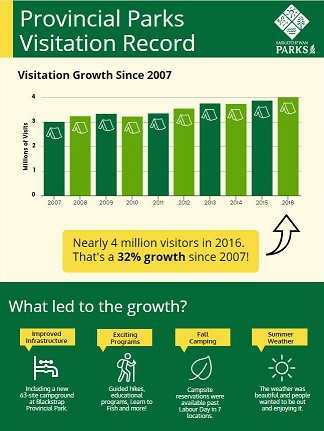 Visitation has been strong to provincial parks for several years, and can be attributed to a focus on providing visitors with engaging programs, desirable facilities and infrastructure, and a commitment to customer service. New initiatives, including the opening of a brand new, 63 site campground at Blackstrap Provincial Park and the introduction of online reservations for fall camping in some locations helped to boost visitation in 2016. In addition to new and improved capital infrastructure, visitors continue to return year after year to take part in the high-quality programs and activities offered in provincial parks. One new program this year, Learn to Fish, was very popular. This program teaches the basics of fishing, including identifying fish, packing a tackle box and casting. This free, lake-side program is great entry point for those who are new to fishing and an excellent refresher for experienced anglers. Learn to Fish took place in nine locations across the province and nearly 400 visitors participated. Work is already underway to plan for the 2017 season. Applications for the seasonal camping program will be available on January 4. Seasonal camping applications will be accepted until February 2 and the draws will be made on February 6. Further information on the seasonal camping program will be available on www.saskparks.net in mid-December, and details on the nightly campsite reservation launch will be announced in January.